Two eminent personalities – Huma Qureshi, actor, and Gurinder Chadha, British director – reached the premises of Gargi College at 2:30 p.m. on 10th August 2017 and proceeded to the Auditorium immediately. Escorted by their bodyguards and the college’s student council, the two celebrities were welcomed with ear-piercing roars and claps as they began to talk about their upcoming move Partition: 1947. After being introduced formally by the General Secretary, Huma proceeded to address the Gargi girls. She reminisced about her college days, classrooms, and teachers. She thanked her alma mater and her drama society’s exposure for making her who is she today. She also mentioned that she was a regular at Mithas and CCD across the street. Huma, expressing her gratitude on working with the established British Punjabi director, welcomed Gurinder warmly to the stage to talk about her new venture. Huma stated that she chanced upon the director’s work in her time at Gargi through its Film Club. She aspired to work with Gurinder since. The audience witnessed great camaraderie between the two women. At one point, Gurinder spoke fluent Punjabi while Huma fell short of words and started laughing. Gurinder complimented the actor, her talent, and her film character’s fierce strength and grit. It was revealed that the film Viceroy’s House, which has been renamed as Partition: 1947, is based on secret documents which were concealed for a period of 50 years from the public. “Being a mother, it is my duty to teach our children topics in an unbiased manner, which we are trying to accomplish with this film”, said Gurinder Chadha. A dance performance by Nazzakat and Sparx, the dance societies of Gargi, was presented before the august audience that left everyone mesmerised. At the end of the performance, Huma and Gurinder joined in with the girls to dance on the latest version of Duma Dum Mast Kalandar from their movie. The director also cleared the air when a question to her asked whether she has always done political films. She said that her films have dealt with political issues in the past such as racism and domestic violence but that this is her first direct film on politics. In answer to another question, Huma revealed that she had dreams of studying at St. Stephen’s but the dream was shattered due to the lack of examination marks. Eventually, she took admission in Gargi, the college being nearest to her parents’ home. She felt blessed and grateful for coming to Gargi as it shaped her into the woman she is today. Towards the end of the event, Huma asked the audience to tweet their pictures along with the movie tickets next week and promised to send an individual reply to everyone. The movie releases in cinemas on 18th August. 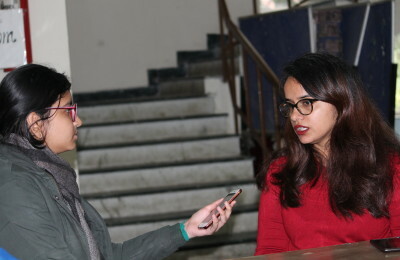 Photos by Kartik Kher for DU Beat.